I&apos;m in Ohio, the home state of two dozen NASA astronauts and the official birthplace of aviation, so it&apos;s in this spirit that I prepare for liftoff. Standing at the helm with the wheel under my left hand, I have my right hand resting on the easily adjustable, single-lever Rexroth electronic controls. It&apos;s a natural fit and feel that inspires confidence while driving at any speed. 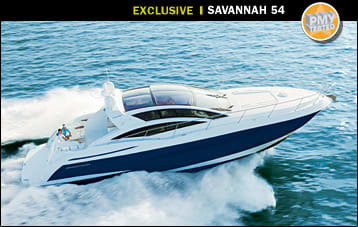 The standard smokey-blue glass hardtop, which spans nearly 14 feet of the Savannah 54&apos;s 16&apos;6" beam, is slowly retracting in response to a switch at the helm. Two custom-built Opacmare stainless steel doors aft in the saloon open as the glass window between them drops down into a high-gloss cherrywood housing via an electric motor. Late-summer sun streams into the bridge deck. 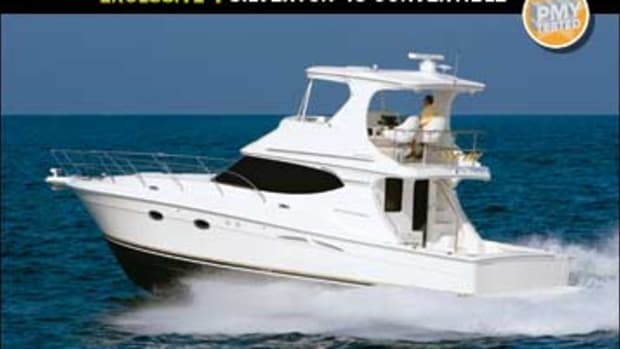 My test boat&apos;s as open as a center console and ready to fly. 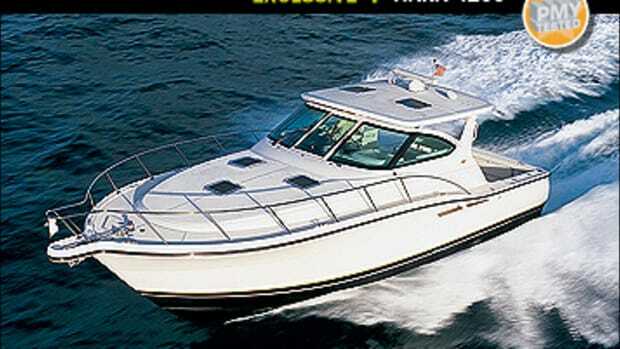 Her standard 800-hp MAN diesels spool up to WOT, and the boat sprints straightaway across Lake Erie at 40 mph. Okay, it&apos;s not space travel, but it&apos;s pretty cool. I slowly bring the throttles back to neutral, curious to double-check her bow rise, since I&apos;ve known several express cruisers with moonshot-like running attitudes during planing. This is not the case with the 54. I ease the controls forward, taking the motors to 1500 rpm (4.5 degrees) and then to 1750 (5.0 degrees). 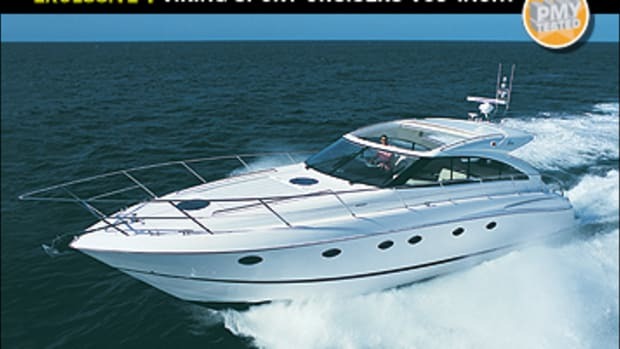 She&apos;s quickly over the hump and trims out at 4.5 degrees at her 2000-rpm cruise with about one-third tab. Sightlines are clear for 360 degrees, and I&apos;m back to WOT, but the starboard motor is turning 100 rpm less than the port motor while all other engine indicators are in the green. Houston, we have a minor problem, cause unknown. 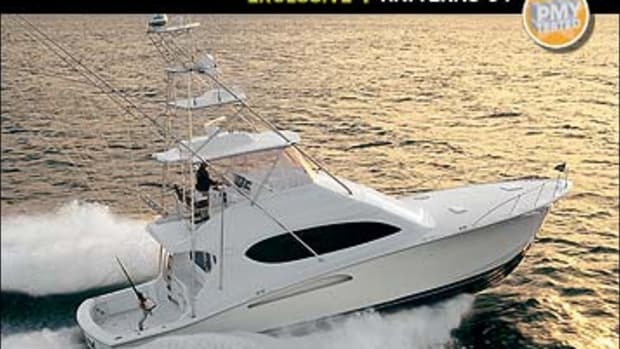 Even with the minimal engine glitch, this vessel&apos;s sleek, curvaceous, European-influenced profile, courtesy of megayacht designer Luiz de Basto, is a blur to Erie&apos;s perch-fishing fleet as the 54 executes fast, hard-over maneuvers with the help of standard power-assisted SeaStar hydraulic steering and high-speed bronze rudders. She stays right with me as I do my best to vent one of her 31x41 five-blade Michigan wheels. But she&apos;s played this game before and banks gently yet quickly into every turn with nary a drop in rpm. Such maneuvers with similar vessels have often left me with restricted outboard visibility, as they dig in on the inboard side, heeling hard over. 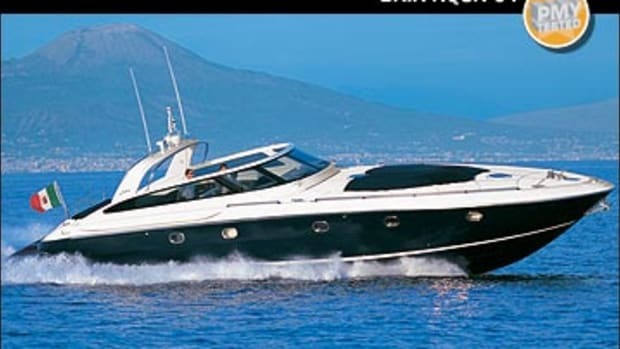 But on this vessel I have a clear view to both the inboard and the outboard sides. 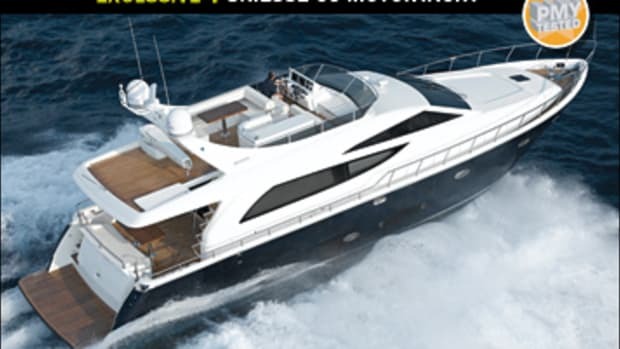 If the Savannah 54 feels well balanced, much of the credit goes to her modified-V hull form—21 degrees at the bow and 14 degrees at the transom—courtesy of the naval architects at Titusville, Florida&apos;s, Vectorworks, which specializes in both recreational and military vessels. I find her even-keel feel particularly intriguing because nearly all of her machinery, from the standard 21.5-kW Onan genset to the chillers for the 72,000-Btu air-conditioning system and the nine 8D batteries, resides under her cockpit. (The builder did this, in part, to keep the vessel&apos;s interior pin-drop quiet.) To compensate, Savannah places both the single 750-gallon transverse fuel tank and the 200-gallon water tank forward of the MAN diesel engines. 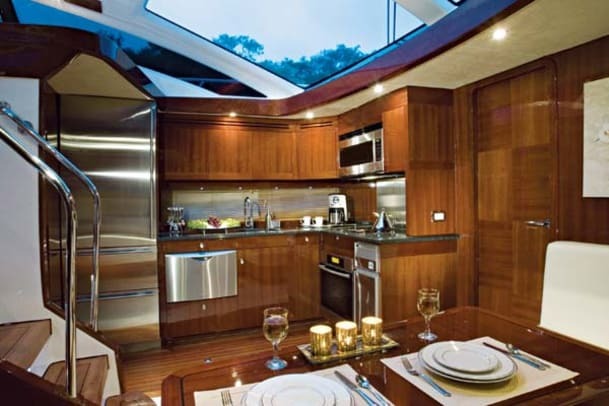 More counterweight is gained by the standard granite countertops in the galley and heads. But performance is just one of the 54&apos;s appealing elements. She&apos;s also about wide-open space. 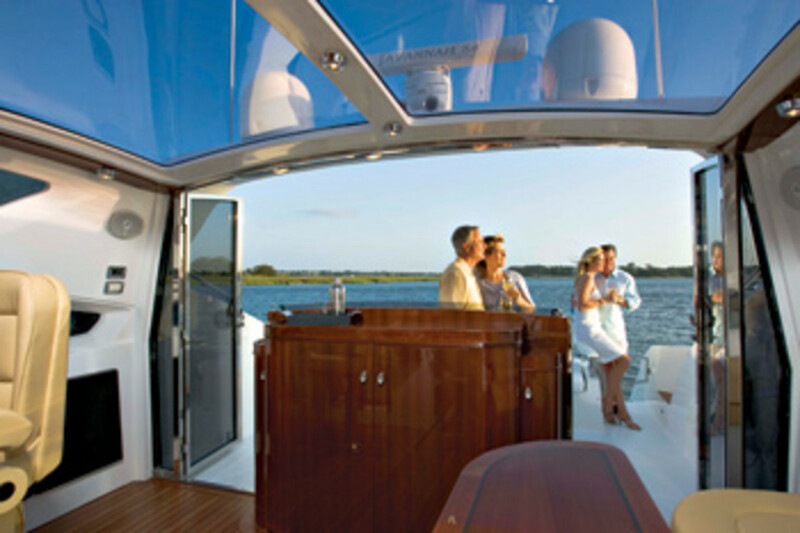 In fact, Savannah Yachts started this project with the patent-pending Atrium Salon that could easily host happy hour for 20. As I look at the openness (we&apos;re talking basketball-player headroom here) of the hardtop area, the aft doors, and drop-down window, I wonder what the heck is holding all this up? It&apos;s a structural marvel. 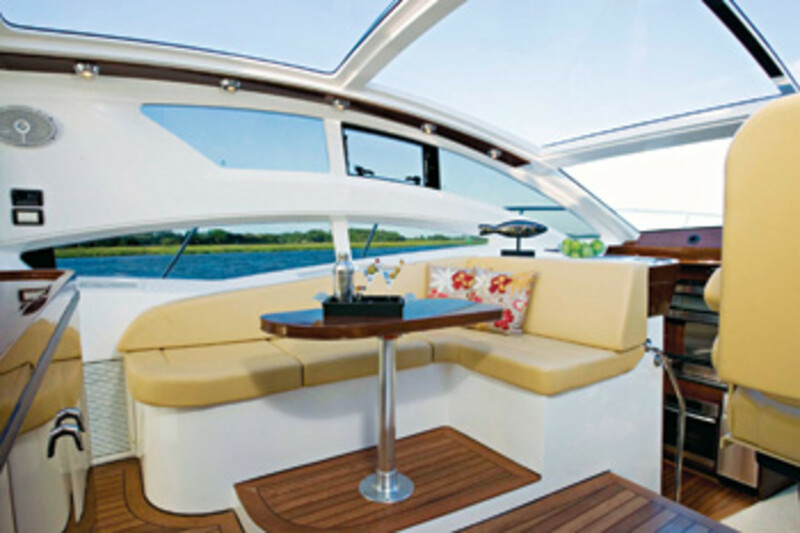 The highly raked windshield and glass hardtop are supported by a massive main bulkhead just forward of the dinette and galley down. Comprised of fiberglass and carbon fiber, which adds strength without excessive weight, it provides I-beam-type support. Yet as functional as it is, it&apos;s also attractive, dressed up in high-gloss cherrywood. Beefy, nearly six-inch-wide mullions secure the front two windshield panes, each measuring 5&apos;0"Hx5&apos;7"W, and even the saloon door provides vital support. All of the abundant woodwork displays a consistent finish and eye-catching sheen. Like many components, the cabinetry and trim are outsourced. 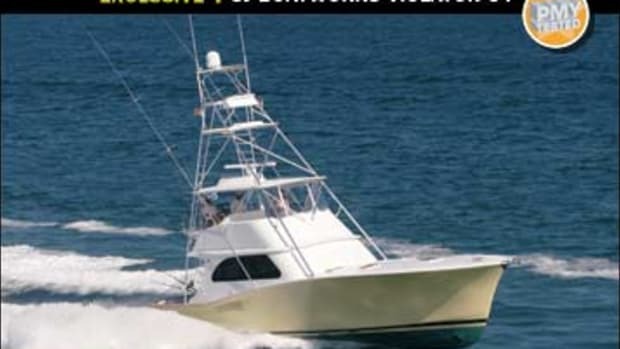 By utilizing subcontractors to handle the woodwork, stainless steel fabrication, and the like, Savannah believes it can more efficiently provide the top-notch fit and finish boaters demand. It takes about 300 subcontractors to bring Savannah Yachts&apos; 54 to life. Talk about managing a supply chain! But even with this logistical juggling act, Savannah says it can build you a boat in about six months. And after six months you get a well-finished product, but nothing&apos;s perfect. As I walk the side decks, which sport an aggressive nonskid, I see that some of the caulking around the window frames and corners could stand to be neater. The foredeck&apos;s nonskid offers equally sure footing, and that&apos;s a good thing, as I&apos;m confident someone will want to catch rays up here on one of the two 6&apos;4"x3&apos;0" sunpads. I work my way back to the saloon and the port-side dinette, which sits just across from the two leather Pompanette helm seats—the captain&apos;s chair is six-way adjustable. A flick of the switch, and the glass hardtop sweeps back closed, while the window&apos;s blue tint cuts the heat by half on the bridge deck—instant relief. It&apos;s time for lunch, and I know the high-end stainless steel appliances (see specifications, this story) in the galley would suffice in preparing a meal with ease, but I&apos;m going to grab a sandwich and a beverage at the Thirsty Pony Grill I passed earlier this morning. 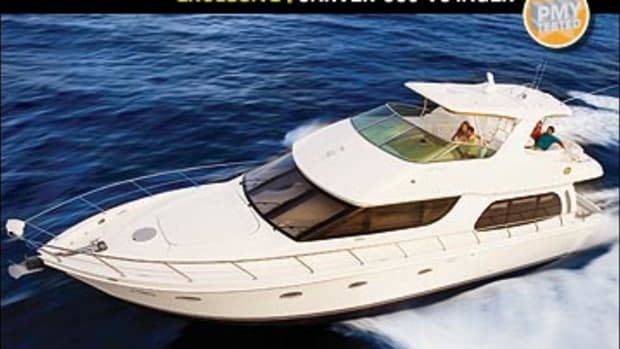 Before I do, though, I&apos;ll say that if you&apos;re looking for a wickedly spacious, two-stateroom cruiser with sleek lines, woodwork that shines, first-rate equipage, solid speed, and eye-pleasing, planetarium-like views, the Savannah Yachts 54 may just be your ticket to ride. 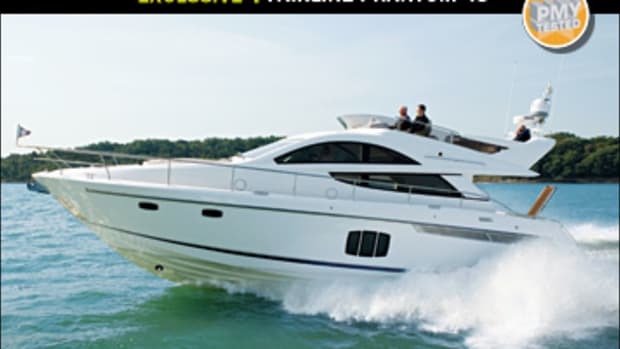 For more information on Savannah Yachts, including contact information, click here. Opacmare designed and built not only the 54&apos;s trademark retractable hardtop roof but the stainless steel saloon-door/ drop-down window system. The heavy-duty, two-door stainless steel structure serves as an attractive entrance to the saloon and opens the space to the cockpit. But most important, its one-piece nature also serves as a main support for the rear section of the hardtop.—P.S.